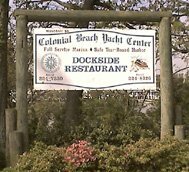 The Colonial Beach Yacht Center is next to the Dockside Restaurant and Tiki Bar at the end of Castlewood Drive on Lunsford Point ("the Point") in our town. Located on about nine acres, this full-service, year round resort facility overlooks the historic Potomac River and Monroe Bay, which is renowned for its protected harbor, deep water, easy access and gorgeous sunsets. The Colonial Yacht Club is based at this location and they hold a variety of events here. 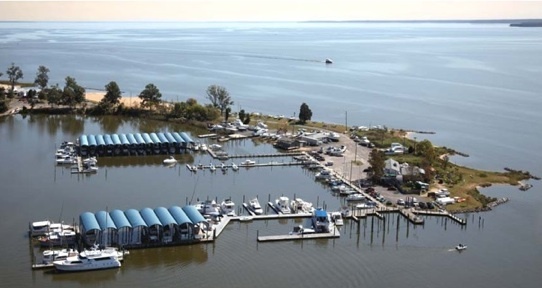 This family-owned and operated facility is a Certified Virginia Clean Marina! They have gone green. The floating tiny house called "Otterhouse" is docked at this location. Bay Breeze Kayak Rentals are also available at this fine establishment. Slips (both open and covered) are available for vessels up to 100ft., Yachts starting at $125/foot Per Year. The Miss Ann historic fantail has been docked here since the spring of 2013 and is currently on the market. There is no charge for Municipal Water or Internet WiFi Access. Please note that during times of very high tide, much of the parking lot will be covered with water. Boat Services Gladys Marine Yacht Sales & Service manages the yard and boat services here. They also run a Yachting Club where members can have use of boats (with one of their captains or yours) and houseboats for an annual fee.